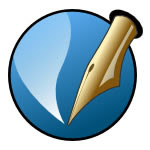 Scribus is an open source Free DTP software in the same league as Adobe Pagemaker. Scribus is the ideal free page layout program for business, education, and small- and home-office professionals who want to create high-quality publications such as brochures and newsletters. Support for professional publishing features such as CMYK color, separations and spot colors. Available at an unbeatable price - Free. I had covered Scribus a few years back. Now Natan Willis has written an article describing in detail the Scribus interface. He also dwells on how to create labels of your exact specifications using Scribus.